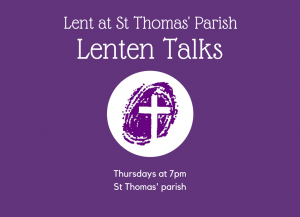 These will take place at 7pm on Thursdays in St Thomas’ parish hall. Each talk will have a different theme and will be interesting and informative. Please come along, and bring as many family members and friends as you can. The first talk will take place on Thursday 9th March. More details on particular talks will be provided soon.